I am sometimes asked what a day is like for our homeschooling family. For us, learning does not occur just in our schoolroom. Learning is a part of every aspect of life, from making breakfast and sorting laundry to language arts and math. Here is a sneak peek into our past three days. Sunday, three very special friends attended church with us. That evening we began a new devotion/mini-curriculum Good Morning, God and the accompanying coloring book. It's a sweet story following a little boy and his family in a week of their daily walk of Deuteronomy 6:6-7. All three kids loved coloring while I read the story aloud. I was fortunate to meet the author's wife a couple of weeks ago at an Apologia Luncheon. She was a wonderful encourager to me. We spoke at length of the joys and struggles of raising boys, especially! I have her book How to Have a H.E.A.R.T. for Your Kids on my nightstand. It is excellent! Later that night, the kids asked to go to the neighborhood pool. There will not be many more warm evening swims. So off we went. It was wonderful. We were the only ones there and stayed long enough to watch the sun set, see the bats zig-zag after their supper, and watch the first stars appear. It was lovely! Our bedtime story was Charlotte's Web. Monday, we began our day with Good Morning, God . Again, the kids colored while I read the story. We later read Bible verses as suggested and had a great discussion about what we treasure. Afterwords, per the kids' suggestion, we rode bicycles in the front driveway. We are learning the hymn "Amazing Grace". After listening to many You Tube versions of the song, we picked a favorite to focus on. Each day this week we are reviewing the Pledge of Allegiance, Pledge to the Bible and to the Christian Flag. Co-op begins soon and we will be reciting all of them during assembly. 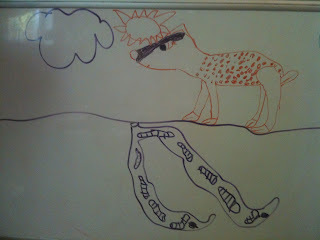 Ryan and I worked on My Father's World -K. We practiced phonics skills, math and writing. Caraline loves math. She completed assigned Saxon Math (2nd grade) workbook pages and practiced addition flashcards independently. We love Bob Jones University Press for language arts. It works for us. Caraline worked on a BJUP spelling page independently as Ryan and I completed our K lessons. For Caraline's copy work we use Bible verses as suggested by our curriculum spine MFW: Exploring Countries and Cultures. We also copy passages from our current read aloud. This morning for review, she read four Grammar Tales books. She also practiced piano. Our breaks are spent outside exploring creation, digging, using our imaginations, etc... Jonathan and Ryan spend most of their day outside. They all helped set the table, make sandwiches and wash fruit for lunch. During lunch, my dad called to say he and my step-mom were only 10 minutes from our house! They live nearly 4 hours away. (Thankfully, our homeschooling schedule can work for spontaneous visits from family!) We were able to visit with them for a while and show them what we are doing in school. Next, we took Jonathan to Kindergym, a preschool gymnastics class. Caraline and I used this time to do an English lesson. She is learning about the writing process. We reviewed and then she finished the final draft of a story written last Thursday. Ryan and I practiced reading and then he played with the siblings of the children in Kindergym. 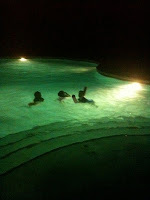 After Jonathan's class, we met friends at the pool and played for two hours. 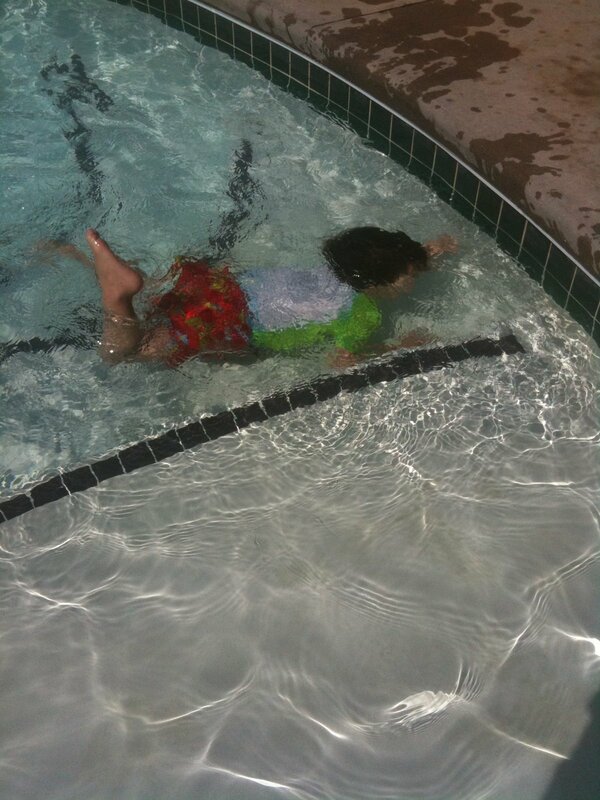 Jonathan is so close to swimming underwater on his own! Here he is practicing on the steps that Caraline and Ryan used to practice on, too! After swimming, we came home and crashed on the couch to an episode of Wild Kratts, had tickle fights with Daddy just before bedtime and we continued Charlotte's Web for our bedtime story. After our read aloud, Caraline began Riding Freedom for her independent silent reading. Caraline: Poems: Review "Try, Try Again". Focus on the third and fourth stanza of "Bed in Summer". 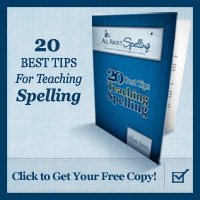 Caraline: Spelling and English BJUP. In English, we are reviewing the writing process by beginning a new story. Her personal story choice spun off into an impromptu study of deer. We called my brother, Brock, to ask some questions since he is an expert on wildlife. (He's even been featured on the Outdoor Channel.) Caraline then drew a fawn on the white erase board and we searched websites, our home library and You Tube for more information on deer. I just love the underground worms she drew. We have an earthworm habitat in our schoolroom. I suppose those little worms were on her mind, too. We talked about habituation from a previous science lesson (our spine is Apologia's Land Animals of the Sixth Day) and read Play with Me. We finished our next Saxon math lesson and then she practiced piano. Ryan spotted two hummingbirds at our feeder! We enjoyed watching them! 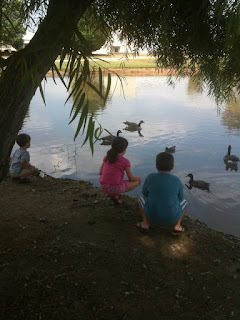 (taking time to enjoy creation is VERY important in our homeschool) Ryan and I then practiced math and reading. We visited our local library and then headed over to a friend's house to drop off some homeschool information. 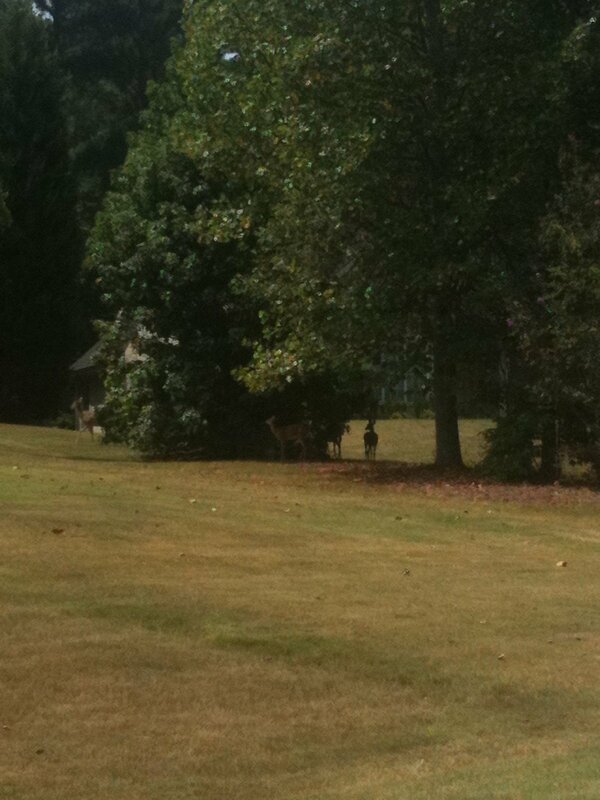 While we were there, we spotted four deer in their neighborhood, two does and two fawns! We watched them for a very long time. 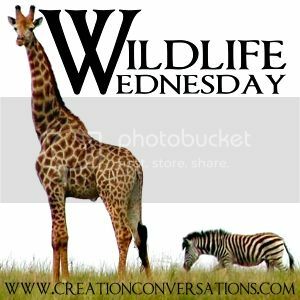 On a day Caraline began a story and research about deer, how awesome for God to provide us the opportunity to watch those sweet ones graze on grass and tree leaves. Near our next stop we visited a wonderful pond with ducks, geese, fish and turtles. We fed our left over bread to the animals. After that, Caraline and Ryan had a one hour gymnastics class. Jonathan and I used this time to grocery shop. While I've been typing this the kids have been playing in the backyard, front yard, catching insects, watching a goldfinch bathe in our birdbath and riding bicycles. Daddy has been outside with us. It will not be long before the sun sets. We are seeing bats and looking for the first stars to appear. 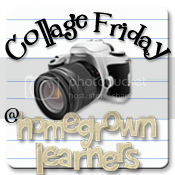 Soon I will be off to prepare for our field trip to the zoo tomorrow with another homeschooling family. So, for those of you still with me, there you have it. A glimpse into what our homeschooling lifestyle is like. 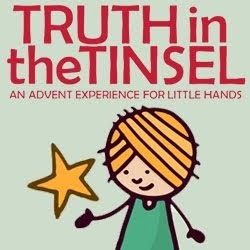 Search Christianbook.com for curriculum, books, and more! See Disclaimer: Homeschooling 3 contains affiliate links, like Amazon, for products we use and love. Simple theme. Powered by Blogger.